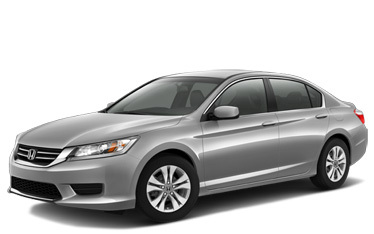 The 2013 Honda Accord sedan comes with some of today’s best comfort features, as well as class-leading fuel economy. And like the rest of Honda’s line, the Accord keeps a strong resale value and has a history of high scores in safety tests. It’s available to test drive right now at Middletown Honda near Newburgh. The four-door midsize class is a tough market, but the 2013 Accord holds its own against vehicles like the 2013 Subaru Legacy. When it comes to value and fuel economy, though, drivers considering the Legacy may rather go with the Accord. The difference becomes even starker when you compare both vehicles’ six-cylinder options. Again, the 2013 Accord offers more power than the Legacy, with an output of 278 hp and 252 lb-ft of torque, while still maintaining an EPA estimated highway economy of 34 mpg when equipped with the six-speed automatic. This is compared with the 2013 Legacy’s 256 hp, 247 lb-ft of torque, and highway fuel economy of 25 mpg. Besides a good fuel economy, drivers also want a full list of features from a four-door sedan. There are several key features that come standard on the base 2013 Accord that are non-standard on the 2013 Legacy. If you would like to test drive the 2013 Honda Accord, we invite you to stop by Middletown Honda. We’re located at 211 Route 211 in Middletown next to GanderMountain. We’re about 35 minutes from Newburgh via I-84. If you have any questions, please feel free contact our dealership. *Based on 2013 EPA mileage ratings. Use for comparison purposes only. Your actual mileage will vary depending on how you drive and maintain your vehicle.